The last time I was in Buffalo was the summer of 2009, during the Bisons’ first year of affiliation with the Mets — the year, you may recall, that prompted the team’s promise to do better by the city of Buffalo. That night, the Bisons started Wily Mo Pena, Jesus Feliciano, Mike Lamb, Javier Valentin, Lance Broadway, etc. It turns out when you’re not too busy grimacing at the state of the Mets’ farm system to notice, Coca Cola Field is a nice park. It’s got good sightlines, local food options, and a big, informative scoreboard. – Jeurys Familia appeared to have better control of his breaking ball than his fastball. Familia allowed a few hits in the top of the third, only one of them particularly well-struck, then walked Paul Janish on four pitches to load the bases with one out and one run already in. From there, it seemed Familia started throwing almost exclusively breaking balls to induce two straight strikeouts. I believe he threw seven straight breaking balls to finish the inning. – By the stadium gun here, Familia sat around 92-94 mph with his fastball. He allowed six hits and one run in five-plus innings, walked two and struck out three. At times it looked like he was getting squeezed by the home-plate ump, but he also allowed a few doubles and a few warning track flies. The most entertaining part of the game was when Joey Gathright struck out swinging at a Familia breaking ball that hit him in the leg and knocked him down. – Spring Training hot-topic Josh Edgin relieved Familia with a runner on second and no outs in the sixth. He struck out the first two batters he faced — both lefties — on a total of seven pitches. The broadcasters here say he hit 97 mph with a pitch last week, but he topped out in the low 90s tonight. He induced a bunch of swings and misses with his slider. – Jenrry Mejia relieved Edgin in the 7th. In his first inning, he yielded a couple of ground balls, a double off the wall, and a pop up. In his second, he walked the first two batters on nine pitches, then allowed a ground-ball single up the middle that scored a run. – Mejia’s wearing No. 57, which is cool because a) Santana and b) Heinz. – Mookie Wilson is here! He and Wally Backman could probably combine to make a hell of a talk-radio team, what with their distinctive and contrasting voices. Also, they have plenty to say about baseball. – Matt den Dekker took a high fastball from Tim Gustafson over the left-center field fence in the bottom of the third. Nine of den Dekker’s 13 hits at Triple-A have been for extra bases. – Many of the Bisons look familiar. Recent Mets Manny Acosta, Pedro Beato, Jenrry Mejia, Elvin Ramirez, Rob Johnson, Brad Emaus, Jordany Valdespin, Valentino Pascucci and Josh Satin are all on the roster. Also, Matt Tuiasosopo looks like a guy who went to my high school. – I didn’t realize it was Irish night here until the 7th inning. I couldn’t figure out why they kept playing songs from Riverdance. – For what it’s worth, Tuiasosopo started at third tonight but also appears to be the club’s emergency catcher. The guy from my high school that he looks like played tight end. – I’m sorry, but “Call Me Maybe” is catchy as hell. Can’t get it out of my head. Growing frustrated. – On a Tuiasosopo double in the 7th, Fred Lewis tried to hurdle the catcher on a play at the plate. It didn’t work. But wouldn’t it be cool if it did? The Wikipedia tells me pickles do not traditionally top beef on weck sandwiches, but I thought they were good, so bully for that guy in front of me for his creativity. 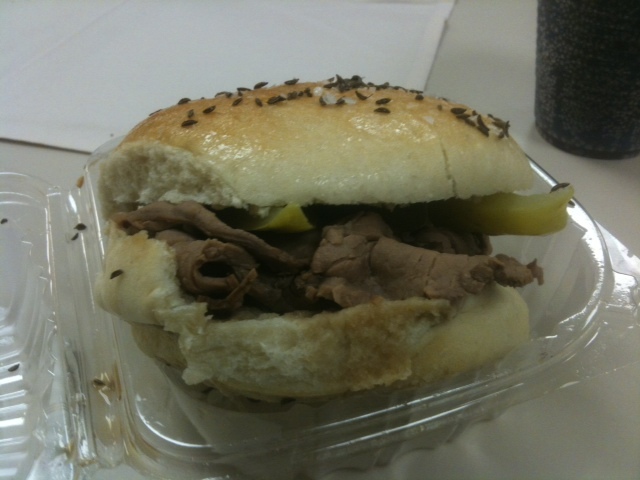 The roast beef was tender and the beef juice tasty, but the real key here is the bread (the weck). It’s a soft, sweet-ish roll topped with salt and caraway seeds, so it’s almost like a big, fluffy rye-bread pretzel. Turns out it pairs well with roast beef and horseradish. I lobby New York bakers to start producing the stuff. – The starting catcher for Louisville: Corky Miller, whom you might remember from various short big-league stints. Miller has an amazing Sal Fasano mustache and is in the midst of his 12th consecutive season in the International League.